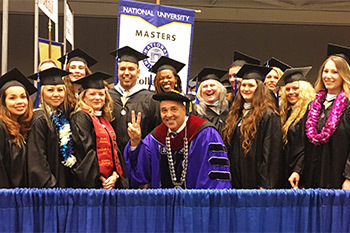 NU’s Northern California graduates celebrate with Chancellor Cunningham. As a non-profit education system, we strive to affect positive change in our communities. Recently, I’ve been able to reflect on the many ways in which the National University System, which includes National University, John. F. Kennedy University and City University of Seattle, work toward fulfilling this objective. In May, we began celebrating graduates for achieving their educational goals, and as May is Teacher Appreciation Month, we took time to recognize educators who give so much to our students. In addition, Memorial Day afforded us the opportunity to pay tribute to the brave men and women in our military and veteran community for their dedicated service to this country. I applaud all of you for your drive and commitment toward achieving your goals. On April 23, more than 500 graduates crossed the stage at National University’s Northern California Commencement Ceremony in Sacramento, CA. It was a thrill to meet the students and congratulate them on their success. During the ceremony, I was honored to address the graduates, and thank not only our students, but also their families and the hard-working faculty and staff for their continued support of our students. I’m so proud of the diverse student community within the National University System. At the Northern California ceremony, the class of 2017 ranged from 21 years of age to the most senior member at 69 years young. It motivates me to see so many people embracing the concept of lifelong learning, and no one embodies this more so than Ed Newman, who will soon be graduating from City University of Seattle with a Bachelor of Science degree in General Studies. Ed’s degree was 40 years in the making, and after serving in the Washington Air Guard and as a successful businessman, we are so proud of Ed for demonstrating that it’s never too late to set new goals and achieve them. I can’t wait to continue celebrating our graduates in the upcoming June commencement ceremonies. Chancellor Cunningham, President Andrews and Dr. Judy Mantle, dean of SCOE with NU alumni at Teacher Appreciation Night. The National University System was founded on the principle of serving adult learners. Deeply rooted in the fabric of the System is the privilege of supporting our military and veteran community as they advance their careers and/or transition to civilian life. At NU’s Northern Commencement Ceremony, we had the honor of hearing from 2017 Sacramento Alumnus of the Year, retired U.S. Army Brigadier General Robert Hipwell. During his 40-year, highly decorated military career, General Hipwell found time to earn degrees ranging from his associate’s degree to a Ph.D., and all the while raising nine children with his wife, Cindi, who is also an alumna of National University. When I think about how much they continue to give back in service to their community, I am thrilled to see individuals such as U.S. Army Staff Sergeant Melvin Correa Lopez, who is earning his Associate of Science degree in General Studies, as the first graduate of CityU’s partnership with Joint Base Lewis-McChord. I am so proud of all of our students, but am especially proud to support those who serve and have served our country so bravely. 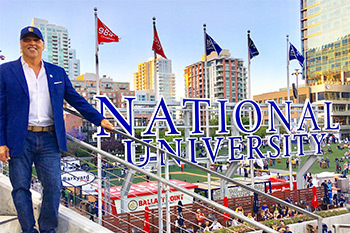 Chancellor Cunningham in front of the National University sign at Petco Park in San Diego, CA. As we continue to celebrate those with dedication and service to the community, I want to thank all of our educators, who work hard to inspire students every day. 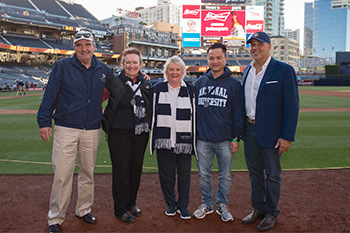 On May 19, National University and the San Diego Padres honored San Diego County Teachers of the Year, eight of whom are NU alumni. We also cheered on NU Alumnus Shaun Bunn, who threw out the honorary first pitch at the game. Shaun is a California State Teacher of the Year for 2016-2017. It’s important to note that learning takes place beyond the classroom as well. Faculty and students of the Sport Psychology Program at John F. Kennedy University dedicate their time to the Solt Evans LEAP Project, an initiative designed to empower and help youth from underserved populations succeed in school, sports and life through mental skill building. I encourage everyone to follow these wonderful examples and strive to not only dedicate yourself to lifelong learning, but to also seek ways to positively transform society through dedicated service and inspiring others.